Sounds nice! I am headed off to the beach for a girls weekend later today! Can't wait! We're heading to the coast too, enjoy your time!! me too! can't wait to get some sun on this body! Good for you! 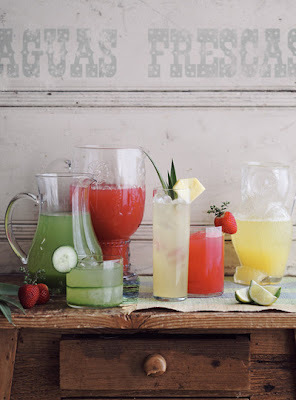 Enjoy...love all of those refreshing looking drinks. I wish I was off to the beach! These are such lovely pictures and definitely induce the need for a beach getaway! Have a wonderful time! How sweet is that toe nail color and the bathroom - lovely and fresh! I'm just about to paint my toenails a bright orange! I love the contrast of hot pink or orange nails in the sand! So cute! LOVE that pale green & tangerine in these shots! Have a great time at the beach. I am following you, I am from Rio come and visit my blog! have a great vaca! Love that bathroom...gorgeous. And those orange toenails! i love way too many images on your blog! !